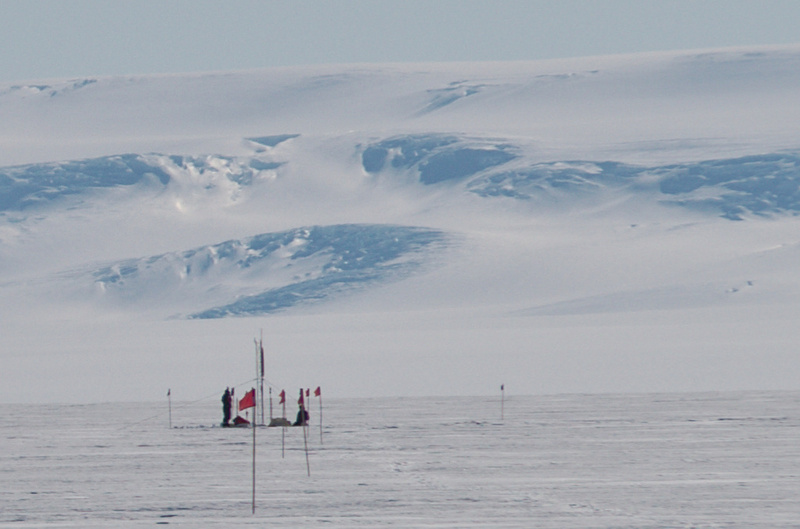 It is quiet unbelievable, but even in remote places as Antarctica you develop such as thing as a routine. Getting dressed in your many layers in a tent is no longer a problem, you know where everything is in your pile of clothes and stuff and you are out of your tent faster than ever. We meet in the kitchen tent for breakfast, someone is on kitchen duty and has set up food and is probably busy melting snow for drinking water. On your way to the kitchen tent you dutifully empty your Pee bottle into the big barrel that is by now almost full and contains amazing 50 gallons or 190 liters of pee and dish washing water. After breakfast we go out make measurements, or stay in and make measurements and pass the time with science until lunch. After lunch we make more measurements and then it is time for dinner, after which another round of measurements follow. Most of the time is spent setting up and cabling equipment, closely followed by waiting for the electronics to do their job and record the measurement. 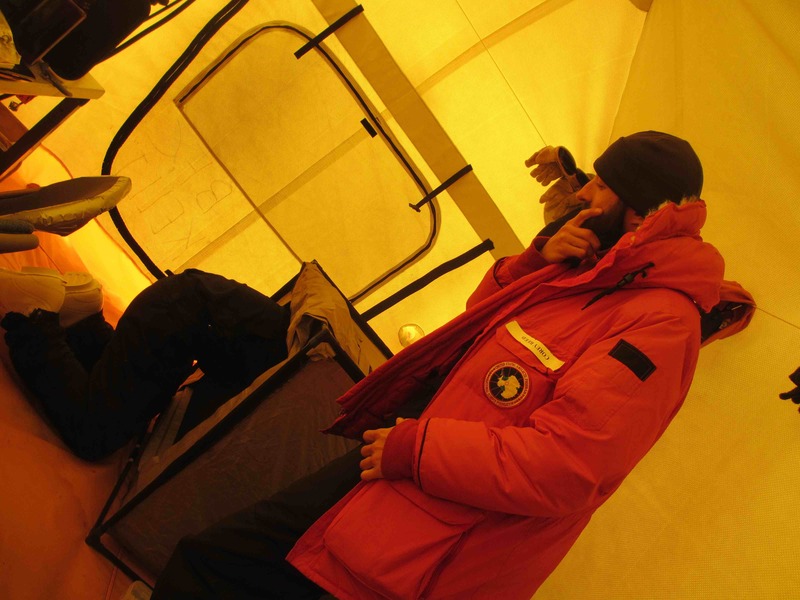 Thank goodness, the support crew from the BFC (McMurdo acronym for those guys) are coming out to help us break down camp, otherwise, we would start feeling to comfortable in our routine. It probably also helps that the weather has been nice in the past couple of days, so we did not have to do any snow shoveling and being outside for the measurements are quite agreeable. However, even is this nice weather, standing around on the snow waiting for a measurement cycle to complete, gives you cold feet -- or in my case, it is either cold feet or cold hands. It seems that my body has decided that there is only enough blood to keep one of the two warm and the other one can suffer. Still, no frostbites to account for so far and the hand/toe warmers have not been used extensively. Somehow, most of them also do not work, so it is more like a lottery anyway. Another interesting side-note that occurred to me this morning was the whole story about peeing when you are cold. I have never had the experience quite like here. In your warm sleeping tent, you sleep for 8 hours without a problem. You get out of the tent, into the cold, and immediately your bladder is screaming: "Empty me". Even if it is totally not worth the effort. Biologically a well-known fact. Your body wants to get rid of fluids so that it has less to warm up. So maybe, it is all connected. To pull out some stereotypes: Men always complain that women are cold and have to go the bathroom all the time. It is also a well-known fact that men have on average a higher muscle to fat ratio than women and muscles generate heat. Thus, men are warmer, need thinner sleeping bags and less clothes. So maybe, all the husbands and boyfriends that constantly complain about their partners, just have not been doing their job right. Keep the ladies warm and then it will save you stopping the car on a road trip every hour. I will add this to "wisdom from Antarctica", you never know, when this could come in handy again. After a lot of excitement about the first Skua, we even saw another one yesterday. Clearly smaller and lighter in color. So, could it have been a different type of skua or a male instead of a female? Some background research on the internet told me that I had hit a blank spot there. There seems to be a large discussion among biologists, in how many species and subspecies one has to distribute skuas and to make matters more difficult they all seem to mix with each other. Thus, I just stick with the fact the the last skua was of a lighter brown and skinnier. I have not taken such a dislike towards skuas yet that I only resort to name calling at the sight of one of them as it is the case for one my colleagues -- I won't be naming names here, of course. All this going out to stations in the snow, is certainly working in favor of my leg muscles. Once out of here, I will be so fit for hiking as I have not been in years. Sadly though that the last thing I want to do when getting back to McMurdo is hiking in the snow. Right now, all sorts of hiking in fact sounds not attractive at all, but probably a couple of nice nights in a comfortable bed and excessive showering will convince me. For the time being, we have science to distract us from missing these essential things. The exciting part about radio science is that everything you do out here disturbs your measurements. For example, you cannot take a clean measurement when you are talking on the VHF radio to each other. In the nice weather and for outside measurements, we have therefore resorted to walking signals. You can easily see someone from a distance of 1 km walking out of a tent. So you can agree on radio silence for a certain time period until you see someone walk. It turns out, 12 minutes of radio silence until you see someone walking turn 12 minutes into a very long time. If we are all in the tent, we just have to turn everything completely off. This means, no internet, no computers, no phones, no satellite-phones, no charging of batteries on the solar panels, no electric lighters, no music players, no cameras, no shaking on plugs and connectors, no unshielded cables on metal tables, and ... I think you get the idea. Mostly, the only thing you can do is sit on your behind and watch someone crawl into the RF quiet tent to fix cables.